Today - October 15 - is National Esthetician Day. If ever you’ve encountered skincare concerns (congratulations if you’re a superhuman who hasn’t), you know the value of a good skincare professional. These experts can skillfully help us through overcoming acne or rosacea, decreasing the appearance of fine lines and wrinkles, hydrating dehydrated, often flaky skin, balancing oily skin or work miracles on unpredictable combination skin. Estheticians are a perfect combination of therapist and scientist, trained on how to make us look and feel our best and most beautiful selves, even when we’re not feeling it. In celebration of this momentous holiday, we asked two of our estheticians at Indulge Salon + Skin to share their top product picks. Kari selected one of Dermalogica’s newest products, BioLumin-C Serum. Why: Drawing from Vitamin C’s natural properties, this highly-concentrated serum will brighten and firm your skin. Lactic acid hydrates and promotes cellular turnover, which helps shed the surface layers of dead and dry skin cells. Sophia Japonica Flower Extract and Chia Seed Oil will lastly help calm the skin, leaving it with nourishing hydration and protect it from free radicals. To use: Cleanse, apply toner then, using a full eyedropper, massage serum into face and neck. Can be used both in the morning and at night. Leroy selected Eye Authority from HydroPeptide. Why: If crushed pearls didn’t convince you, read on. This eye cream is the ultimate multi-tasker. It brightens dark circles, reduces puffiness and the appearance of fine lines and wrinkles (even crow’s feet!). This deeply-hydrating product contains black pearl peptides and hyaluronic acid that will keep the delicate skin around your eyes supple and moisturized. His favorite part? Included in Eye Authority’s formula is a crushed pearl powder that brings immediate radiance to dark circles. To use: Apply a half pea-sized amount of product to the skin contour around your eyes both in the morning and at night. Use regularly for at least two weeks for optimal results. Questions? Stop in to consult with our esthetics team at Indulge Salon + Skin on Silver Spring Drive in Whitefish Bay. We’ve seen evidence of early Spring blooms around the Bay and it got us thinking about finally peeling ourselves out of a winter coat and chunky sweater and into more warmer-weather garb. The best Spring look of all? Fresh and luminous skin, of course! As beauty junkies, we’re always excited to try new skincare technology, but when we tried the NuFACE toning device, we knew we had to make these results available to our clients. The NuFACE device reduces wrinkles and smooths and tones the skin through microcurrent technology that stimulates collagen and elastin. Yes! NuFACE is the first and only FDA-cleared, handheld toning device for contouring the skin, improving skin tone and reducing wrinkles. Yes! A few members of the Indulge team have started using NuFACE regularly and we’re already loving the results we’re seeing. But you don’t have to take our word for it… An outside study was conducted to explore the effectiveness of the device. The results of the study reflected ours. When using the NuFACE Trinity for just five minutes per day for 60 days, 85% found improved facial contouring, 80% felt that their skin was smoother and 77% reported that their face was more toned. We like to accompany our NuFACE device with brand’s Gel Primer or Hydrating Leave-On Gel Primer. There are additional products and serums available to target specific skin concerns such as the Lifter Infusion Serum, the Smoother Infusion Serum, Anti-Aging Infusions and a Wrinkle Reducer. From start to finish, using the NuFACE is an easy 3-step process. With a clean, dry, makeup-free face, apply the primer of your choice. Second, simply glide the NuFACE device slowly over the contours of your face starting at the chin and moving upward (the device will beep every three seconds to ensure you’re treating each side evenly). You’ll repeat this action three or more times, slowing your movement through areas of concern. Finally, using your cleanser, wash off the primer (unless you’re using the Leave-On Gel Primer) then apply your favorite moisturizer. And just like that, wah-lah! Beautiful, soft and smooth skin. Mostly nothing! Of note, there’s no vibrating or pulsing like we expected. Using our Trinity Pro, there are two metal spheres that gently massage the curves of our faces. If we add a bit of pressure, it’s heavenly! We carry the NuFACE Trinity Pro (a stronger version of what you’ll find elsewhere) at Indulge Salon and Skin for $325 and the NuBODY for $399. It’s recommended that those who are pregnant not use the NuFACE toning device. If you’re interested in learning more about NuFACE and if it’s a good fit for you, stop in for a consultation with one of our estheticians. Indulge yourself! Come pick up either of the NuFACE devices we carry in preparation for warm weather days. At Indulge Salon and Skin in Whitefish Bay, we’re all about connecting you with the experts and products that help you look and feel your best. We look forward to seeing you! Does LED Light Therapy Actually Improve Your Skin? LED light therapy promises to improve acne, hyperpigmentation, wrinkles and fine lines. A lofty goal, right? We can feel your skepticism; we felt it too. Until we tried it. Breaking it down, LED stands for light-emitting diode. According to Celluma’s website – the brand of light panel we have - LEDs utilize, “specific, proven wavelengths of light… [to] increase circulation, accelerate tissue repair, kill acne bacteria, decrease inflammation, improve skin tone, texture and clarity,” among other uses. We sat down with Indulge esthetician Kari to learn more. Is it safe? YES! Celluma LED light therapy is safe, clinically proven and FDA cleared. So, what’s the treatment experience like? Celluma is a non-invasive treatment and is as easy as taking a nap (and many clients do!). There’s zero pain and the only thing clients might feel is a gentle warmth emitting from the panel. Treatments typically last between 15-45 minutes, but it’s customized to meet a client’s unique needs. How long has it been at Indulge? Celluma LED light therapy hit the Indulge treatment room just about a month ago. Already, we’ve had a lot of clients express interest, see results and come back for more! Does the Celluma LED panel work differently to treat different symptoms? Yes. The blue light is primarily used for acne, reducing inflammation and serving as an antibacterial treatment. The red light promotes collagen production, helping to smooth out fine lines. What results are you seeing so far? Before we even got the Celluma LED panel in, I’d already started recommending it to a few of my clients. One particular client who suffers with stubborn acne was an early adopter and looked forward to trying it out. She’s already seen noticeable improvements in active breakouts, skin tone and collagen production. What’s different about LED light therapy from other therapies you use? We’re using LED light therapy to compliment other interventions including peels and facials. Even as a standalone treatment though, LED light therapy is a great non-invasive solution to address common skin concerns. How does one get started? Call us at (414) 431-3155 to schedule a skin consultation! See you soon! ‘Tis the season for whimsical romance and annual reflection… and that seemingly inevitable feeling that the skin on our face has tensed and tightened as much as our bodies do entering a wind chill of eighteen below. We’d try a lot to have beautiful, just-left-the-salon hair without having to spend hours getting a retouch every week, AMIRIGHT? The latest color techniques were designed with us in mind: between work, kids, responsibilities at the house and hitting the gym (nothing like a new year’s resolution, right? J), we lead pretty busy lives, but that shouldn’t mean we have to sacrifice hair with great depth and dimension. Say goodbye to colored stripes of the past and enter balayage, shadow root and color melting: the newest and hottest hair color techniques to hit the industry. Each their own unique evolution of the ombre, these techniques are all about low maintenance simplicity while still maintaining a high-end yet effortless look. If there were a ‘break the internet’ of hair color, balayage is it. The first technique to pull away from stripy highlights of the past to a soft, sun-kissed look, ‘balayage’ is a French word that means, ‘to sweep’ or ‘to paint.’ The technique is a combination of sorts between highlights and ombre - done freehand and the process is done not with foil – but plastic wrap, which is far more malleable and thus creates a softer, more forgiving look. Balayage is completely bespoke – tailored exactly to what your #hairgoals are, whether you’re looking to incorporate a funky color, make your blonde hair even blonder, or simply add a bit of dimension to your warm tone. This technique is great for lengths as short as a pixie to long as waist-length and beyond. Shadow Root is an edgy, on-trend result more than it is a color technique. It embraces the strong dichotomy between a dark natural base color and a dynamite color job – usually much lighter than the root creating the appearance of a shadow. The difference between a shadow root and a traditional highlight, though, is that it employs the balayage technique to create a gradient rather than a harsh, blunt color line. This look is very ‘it-girl,’ so if you want to make a statement, shadow root it is! Similar to balayage and using a concept similar to contouring in makeup application, color melting creates an even more fluid, subtle highlight incorporating at least three colors. The technique offers less of a blunt pop of color and more of a color gradient – creating a seemingly effortless fade – or melt – from your natural color into the lightened color. The result: a soft, warm finish… and because we apply color vertically rather than the horizontally, there’s no defined line where natural color ends and the highlight begins, so you don’t need to be concerned with the appearance of grown-out color before your next visit. Ready for a fresh look for your locks? We can’t wait to use one of these awesome cutting-edge techniques to glam up your look! 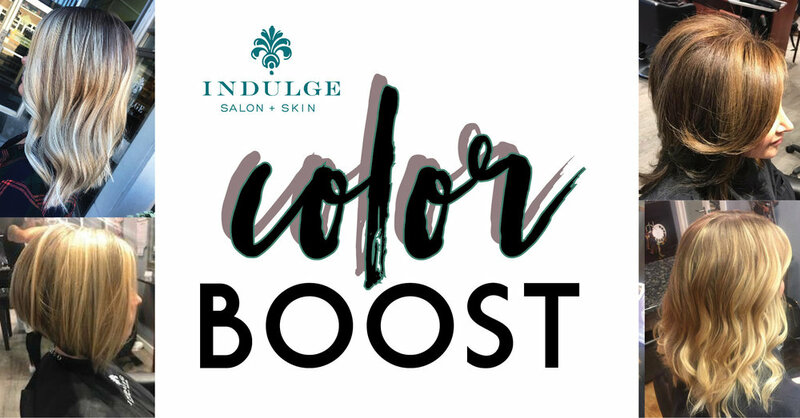 Book with one of our colorists at Indulge Salon + Skin in Whitefish Bay today: (414) 431-3155. Pull out your cozy sweaters, chunky scarves, and tall boots as you sip on that Pumpkin Spice latte fireside because Fall 2017 is here! We’re breaking down the hottest cool-weather looks for this season: which trends are you ready to try? Variations of the bob, lob (long bob) and pixie are in. The key to pulling off any of these looks, the runways tell us, is incorporating tousled layers, texture and subtle color into the look. Soft, long-length looks held court on the runways, as well. The emphasis this season, though, is less about the cut itself and more about color and styling. Hair painting continues to dominate the industry. The difference between hair painting and traditional highlights? Techniques like balayage and flamboyage employ a free-handed application to create a more natural look, lessening the need for frequent touch-ups. Bold colors are IN. We’ve seen the likes of Rihanna and Katy Perry rock bold colors. Perhaps too much, though? Try peekaboo color – a way to incorporate fun, punchy colors underneath your top, most visible layer. With a bit of styling, that pop of color can be a subtle and fun way to give you a boost. Across the board, the look this season embraces a natural, free-flowing, earthy look. Long, loose waves, natural curls, loose, bohemian up-dos and braids of all sorts – microbraids, woven buns, sweetly swept back and even cornrows are all the rage. Perhaps the most edgy look, though, is the deep-part, polished ponytail. Try playing with texture, too: adding a wave or maybe even a bit of crimping, and accessories. Ready to fall (back) in love with your hair? Achieve your vision by stopping into Indulge Salon + Skin to consult with one of our talented hair artists. It’s a wonderful feeling, leaving the salon after getting a fresh new ‘do… the feeling (we presume) of being the subject of a fancy shampoo commercial. So why leave it to your monthly, quarterly or even semi-annual visit when you can replicate the look and (close to) the feeling at home? Our resident expert Tracy weighs in on how to make that happen with just four easy tips. Tip 1: Much like good make-up starts with healthy skin, fresh styles start with healthy hair. High-quality shampoos and conditioners contain a high concentration of ingredients that are beneficial to your hair. Though some drugstore brands boast including many of these ingredients, they’re often low in volume and also include damaging chemicals and fillers that can dry your hair out, making it brittle and dull. Tip 2: Perhaps the most overlooked tool in all those in our arsenal, the hairbrush we use daily plays an important role in cultivating healthy, shiny locks. Bristles in a quality hairbrush are designed to be heat resistant. There’s no question we need heat to create the volume we seek. Using a blow dryer with a cheap brush can cause plastic bristles to melt, damaging our hair. Surprisingly, the handle is also an important component. To avoid frizz, we need the brush to maintain tension with our hair. A silicone handle helps us maintain firm control while preventing fatigue. Side Note: Ceramic? Tourmaline? What does it all mean? · Ceramic brushes are those that either have a barrel made entirely of ceramic or have a ceramic plating around a metal barrel. They’re best used for long and/or damaged hair because they distribute heat evenly through vents and/or holes in the brush. · Tourmaline – also called ion – brushes release negative ions, helping to reduce static electricity aka frizz. Products we love: Ergo ceramic brushes for styling and the Wet Brush for wet hair or extensions. Tip 3: There’s a reason blow dry bars have taken the nation by storm in recent years. Who doesn’t appreciate a good blow out? The look gives an air of simple yet refined elegance, but it doesn’t come without risk of damaging your hair. ­­­­A quality blow dryer and the right products are necessary to keep your hair glowing and amply moisturized. Tip 4: If you’re a curly girly and prefer the straight look, a flat iron is likely part of your daily routine. That’s great! Conversely, if your hair is straight and you prefer a little zhush from time to time, you’re likely to use a curling iron. Also great! The same principle applies to both types of iron. Protect your hair from heat! Not sure where to start? Not sure how to edit what you’re currently doing? Stop into Indulge Salon and Skin in Whitefish Bay to consult with our hair experts. Many of us are heading off on our annual summer vacay in the coming weeks before (gasp!) school’s back in session. Our skincare expert has gathered her top tips for vacation-proofing your skincare routine (preview: don’t change a thing! Keeping it consistent with your day-to-day routine will ensure there are no disruptions). Exfoliate! Doing so will allow your skin a head start on your R&R time by clearing out any congestion that might’ve built up with your early-summer skin exposure. Moisturize. Give your skin a healthy, radiant base by keeping it amply moisturized. Plan ahead. Stock up on travel-size products. Not finding what you need? Purchase small travel-size containers that you can transfer your products into. Also notable when looking ahead? Pack enough SPF to cover reapplication between your morning walk, pool/beach time and dinner. Lip balm. Easily forgotten, your lips are especially vulnerable to sunburn. Be sure that that product you bring has at least 20 SPF to keep your lips soft and hydrated. Drink up, buttercup! Keeping yourself hydrated with plenty of water is critical. Apply moisturizer (yes, again). Lock in the hydration so the dry, recycled air thousands of feet above ground doesn’t dry you out. Keep your cleanse and moisturize routine, but forego intensive exfoliation. SPF, SPF, SPF. On your face AND on your body. Then reapply. Then reapply again. Even with SPF on, you can get some good color. The most important thing, though, is that you’re not leaving yourself fully exposed to the sun’s harmful rays. If you get a little too much exposure (surprise, surprise), treat yourself with a cooling masque from Dermalogica or some aloe vera to both give you some relief and kickstart the healing process. If you need a little help along the way or some premiere products in travel sizes, stop in to Indulge Salon + Skin in Whitefish Bay. Safe travels, beauties! We can’t count enough strands of hair on our heads for the number of times a client has walked through our doors, shuffled to our chairs and excitedly blurted out her/his dream hair style... #HairGoals if you will. We want to help you get there. In order to do so, we’re offering you a short list of the do’s and don’ts when talking to your stylist. Between seaweed soaks, uber-pricey age ‘reversing’ products and yes, even placenta facial creams, there’s no question the skincare industry has become overcrowded and nearly impossible to navigate, leaving us all to wonder what’s actually necessary and helpful for our skin. What we all want is pretty simple, right? Clear, smooth, glowing skin. So let’s break it down to the basics… a simple three-step regimen. 1. Cleanse. This one is obvious. Use twice daily. Why, you ask? Your skin does most of its repair overnight, leaving dead skin cells at the surface. Similarly, after a long day of exposure to environmental pollutants, make-up and oil build up, pores can begin to clog and therein lies the issue. Wash once at the beginning of your day and once at the end. 2. Moisturize. We live in Wisconsin, so our skin is constantly in a period of adjustment to our varying weather. Without it, skin can appear dull and exacerbate fine lines/wrinkles. And, like any dry skin, it’s uncomfortable and itchy. 3. Exfoliate. Removing dead skin cells is also a no-brainer. Without even a gentle exfoliator, that dead skin just sits atop the surface. Exfoliation is also critical to healthy cell regeneration – the process of shedding dead skin and generating new cells. Now for our list of favorites in each category! · All Skin Types: Our first suggestion adds a (half) step into your regimen, but it’s so worth it. Dermalogica’s Pre-Cleanse will remove/dissolve make up. It’s a light oil and water soluable, so it’ll take just an extra minute or two to work into your skin, setting it up for a deep cleanse. You can do a lot with moisturizers. If you’re someone who doesn’t have a lot of time to spend on a skincare regimen, consider starting out with something simple. If you are experiencing a lot of dryness, consider incorporating a serum into the mix for a more targeted, deeper condition. · For Oily Skin: Dermalogica Active Moist. Light moisturizer and oil free. · All Skin Types: Dermalogica Skin Smoothing Cream. A medium-weight moisturizer designed to address light dehydration. · For Dry & Aging Skin: Dermalogica Intensive Moisture Balance. A rich moisturizer designed to smooth out fine lines and wrinkles. If you want to take moisturizing to the next level, add a serum. · For Dry & Aging Skin: Glo Cyto-Luxe Serum. Smooths the appearance of wrinkles by promoting collagen and softening expression lines. · For All Skin Types: Dermalogica Skin Hydrating Booster. Super concentrated hydrating serum. · For Dry & Aging Skin: Dermalogica Daily Superfoliant. This highly-active resurfacer fights environmental triggers and leaves you with uber soft skin. · For Dry & Aging Skin: Dermalogica Multivitamin Thermafoliant. A heat-activated scrub mixes both physical and chemical exfoliants to refine skin texture and prevent skin aging. Questions? Stop into Indulge Studios + Skin for a complimentary consultation with our Aesthetician for tips on an individualized regimen that will work to address your specific skin concerns. With record-high temperatures the past few days, it’s easy to overlook how dry our hair has gotten through the long winter months. At times we’re reminded to moisturize because of a flaky scalp, but our hair tends to show less overt signs of needing moisture. o If you’re noticing dry hair, consider washing every other day and/or incorporating a shampoo that’s designed to help your dry hair replenish and lock in hydration. Product to try: Davines Momo shampoo. o Dry shampoos have come a long way in recent years to absorb product build-up and pull excess oils and dirt, leaving you with strong, soft hair and a healthy shine. Try Oribe’s Gold Lust Dry Shampoo; we’re big fans! o As an alternative, stop into Indulge for a blowout. We’ll use the Oribe Imperial Blowout, which is designed to make the treatment last longer so you don’t have to use your heated products as frequently (and your hair will smell like heaven!). Not sure what the best next steps are for you? Stop into Indulge Studios + Skin – we’ll consult with you on the best products and strategies for hydrating your hair! Eyebrows are all the rage right now, and rightfully so. Well-executed brows can elevate EVERYTHING about your face that you enjoy highlighting – your cheekbones, full lips, overall structure, those popping eyes of yours, etc.